← UNDERSTANDING SPAIN 15 — A Year in… Politics? 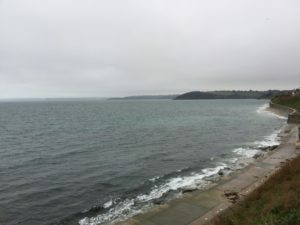 Last week I had a few days to kill before returning to Spain and so I decided to spend them in Falmouth. 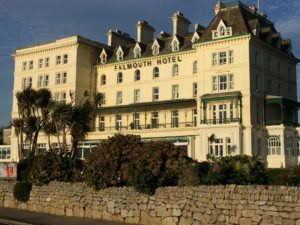 It’s Monday afternoon and I check into the three star Falmouth Hotel, selected for the following reasons: a) it’s cheap, b) it’s located bang on the sea front with good access to the Cornwall coastal path and, c) it has a large secure car park. But on Tuesday morning, instead of grinding out the last few chapters of my novel, I find myself exploring the town. In all honesty, there’s not much to explore and on a drab December day I begin to wonder just why the heck I’m here when I could be on my way back to Spain? there’s not a vast amount to entice the casual tourist to part with their cash. 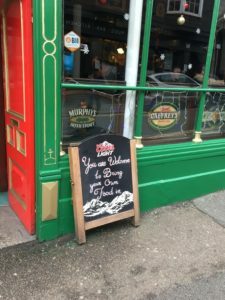 There are plenty of pubs though, and even an Irish bar so desperate for trade that it invites potential customers to bring their own food. And the fact that the Wetherspoon’s is the most attractive looking hostelry in town says quite a lot about the place. Bring your own? Never saw that before! I’ve stayed here before, of course. When coaching Sidmouth Rugby, we had league encounters against Falmouth and once overnighted in a particularly dreadful doss house near the town centre before and after the game. A friend recently reminded me of this trip, the ‘highlight’ of which was provided by a lad one of our supporters had brought along. Thierry (not his real name) was looking after a youth we quickly named ‘Mental Mickey’ (not his real name either) who had Tourette’s, and whose favourite utterance was “F**k me… this is f**king mental!” As you may imagine, although entertaining at first, this was a phrase which, when yelled at maximum volume repeatedly, began to grate a little after two days. But it appeared to go down rather well with some of the locals, and by Sunday morning he had grown his own cult following. By 11am I feel that Falmouth has little to detain me further, but on the way back to my hotel I pass the Prince of Wales pier and notice that a boat trip to St Mawes is about to depart. Without giving due consideration to either the purpose or the efficacy of this trip, I part with £9 and find myself at sea with the only other passenger, an elderly woman who spends the entire thirty-minute trip engaged in an animated conversation with her handbag. St Mawes is a delightfully secluded costal village consisting of two hotels, a few pubs and a smattering of rather expensive looking lime-washed cottages — almost certainly all holiday homes. 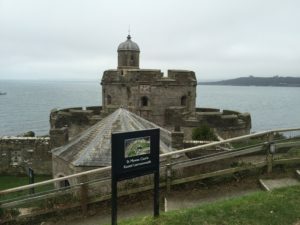 St Mawes Castle. Great view but worth the ferry trip? arse by the woodburner, read the paper then yomp up to the castle and return to the harbour in time for the 12.30 return trip to Falmouth. Back on terracotta — as Del Boy would say — I find a café that serves only pasties and I eat the largest beef pasty I have ever been presented with. It is so large that I require almost half a bottle of HP sauce to season it and two pots of tea to wash it down. Now, I should perhaps say a word or two about the indigenous population of Falmouth. Just one of many pasty emporia. 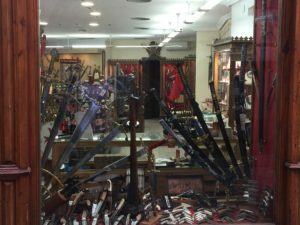 Toledo sells swords and armour, Falmouth sells pasties. End of. Of course — like all English seaside towns — Falmouth has its share of feckless oicks; lads on Chav bikes brandishing paint sprays who terrorize old people, and whose antecedents idolatrized ‘Mental Mickey’. However, it has fairly recently seen a large influx of students, as Exeter University has spread its tendrils to the far-flung outpost that is Penryn. As I wade through my pasty I note that most of my fellow diners are students. I know this mainly from their attire, and from the fact that they clearly have absolutely nothing better to do on a Monday afternoon than sit in a café and make a coffee last an hour. And I also know this from the observation that every second word in their conversation is ‘like’. I slip into a routine of breakfast (after being insulted by the waiter) an hour’s yomp around the castle, and then settle to writing. A bowl of soup for lunch then a run on the coast path followed by more work. Dinner, more work and then bed. Tuesday and Wednesday I manage sterling progress on the novel. She could be right. Who knows? But it does have a great plot… they both do. So, maybe readers will have low expectations? Like my fellow residents of The Falmouth Hotel, they will settle for mediocrity. I’ll come to that shortly. I’m really selling this well aren’t I, dear reader? No seriously, it is bloody good — I kid you not. So each morning I find a table with a sea view in the lounge to base myself, much to the annoyance of the twelve o’clock influx of octogenarians who swarm in to sip sherry before they adjourn to the dining room for Christmas lunch — the sprouts, I’d imagine, will have been on since November. food is truly dreadful. My pasta is soggy, the fish batter has the texture of concrete and my poached eggs at breakfast are like house bricks. Some of the staff are extremely helpful while others are unbelievably rude; my room is like a sauna as it’s not possible to turn the central heating either down of off, and the gym is somewhere between useless and a Health & Safely Armageddon waiting to happen. Eventually, I speak to the manager and tell her that she can either find me another room or refund the payment for my final night and I will attempt to find a hotel where I can manage to sleep with sweating off half my body weight. Consequently I am moved to a vastly superior room overlooking the sea, but — most importantly — one where it is possible to control the temperature. By Friday morning, I’m semi-institutionalized and ready to go. I leave The Falmouth Hotel without sepia shaded glasses on Friday morning. A beautiful picture in a beautiful frame… F**king Mental! 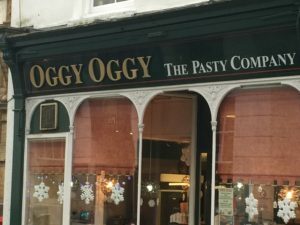 This entry was posted in Blog and tagged Cornwall, Devon, Falmouth, pasties, St Mawes, The Falmouth Hotel. Bookmark the permalink.